This pattern comes from the book Picket Fences number 1123 from Jeanette Crews Designs, Inc. 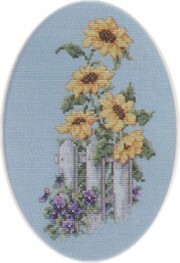 The pattern displays a white picket fence with sunflowers at the top and purple pansies at the bottom. With Supplies: $24.10 You download the design. We will send you, 18 skeins of DMC Floss & Wichelt 14ct. 18" x 21" Aida (Wedgewood) to complete your project.